The B1X 500 AirTTL 2-Light Location Kit includes two B1X flash heads with 80% brighter LED modeling lights and batteries with 50% greater capacity (325 full power flashes) and High-Speed Sync that's able to use the full 9-stop power range. Also included are an AC battery charger, a car charger, and a Backpack to store and transport it all. All of the familiar professional and convenience features we've come to expect from Profoto are onboard. The B1X has the same dense, durable polymer housing, integrated 77-degree reflector, built-in receiver compatible with Air Remote TTL remotes, and intuitive highly visible controls and display. 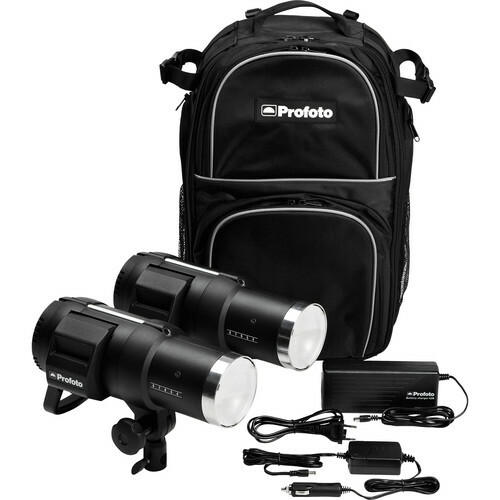 Includes Backpack, 2 B1X 500 AirTTL + 2 Li-Ion batteries, Battery charger pack, 4.5 A, Car charger, 1.8A, Power cable, USB A to mini B cable, User guide/safety instructions, User guide battery chargers, 2 Color gel starter kits with 2 large rings and 2 smaller rings, 2 gel packs with 10 gels each, mounting instructions, 2 Color correction gel packs with 20 pre-cut gels each, Profoto air remote TTL-F in bag, needs 2AAA batteries, USB 2.0 cable, Type A to Mini B 0,6 m in bag. 2 Matthews Merf Mini extendable reverse stands.